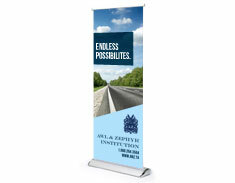 These premium pull-up banners are great for conferences, expos, and trade shows. Placed at entrances and near your kiosque or booth, they present corporate information where they are needed for maximum impact and message delivery. Ensure that your PDF artwork is 33” x 81”. The bottom 3” of your artwork should not consist of important artwork because it will be hidden by the stand.